We love steampunk, and we love dressing up together. Our kids chose for us to "punk up" Wonderland together. My husband and I are the Kind and Queen of Hearts, my oldest son is the Mad Hatter, two daughters are the Tweedles, youngest daughter is Alice, and youngest son is the March Hare. My husband, fashioned our crowns out of craft foam, acrylic paint, rhinestones, and a lot of hot glue. The cartoony teacups for the Mad Hatter and the March Hare were made the same way. The Queen's scepter is made of a croquet mallet with a heart embellishment made of foam. The King's scepter is the same, except just with the croquet mallet handle. The Queen's scepter is much larger than his, to match her domineering personality. We made the Mad Hatter's hat out of an exercise mat, epoxy, hot glue, craft foam, and paint. We used old soccer shin guards to create gauntlets, "punking" them up with spray paint and gears. I made knickers for Tweedle Dum and Tweedle Dumber (they both wanted to be Tweedle Dum, so I renamed them) out of my son's outgrown khaki pants, and added propellers to golf caps I found at the thrift store. I made the girls sew gears onto their suspenders so they could get some sewing practice. 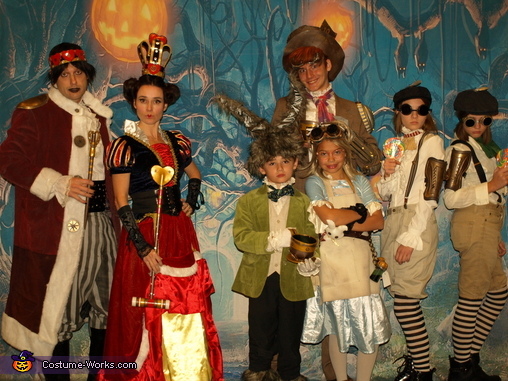 :) Alice, the Hatter, and the Tweedles all wear steampunk goggles, which are welding goggles painted metallic gold/brass. The Mad Hatter has a mechanical robotic arm holding up his teacup. We sewed silver metal shoulder and elbow plates with gears onto his suit coat along with a silver metallic cylinder for his forearm, through which we laced white twinkle lights for a mechanical effect. I also sewed him a colorful vest out of our old shower curtain. The March Hare was the biggest challenge for me. I created the fur feet, legs and head/ears by cutting up a ladies' faux fur vest I bought from the thrift store. I used the vest's lining as the lining for the ears, and the back lining piece as the foundation for the vest I made for the Mad Hatter. The March Hare's feet were twice as big as his shoes: I found styrofoam from a TV box and cut it to form rabbit toes. I taped this to my son's shoes, then glued the fur over top to cover it. I made legwarmers for the legs, and stuffed them into the knees of his knickers so it looked like his furry rabbit legs and feet were showing. I had just enough fun left over to make the head. I made the ears rigid using a folded wire coat hanger, and built the head around a plastic bowl. I ended up having to add an elastic strap to keep the head on my 7-year-old son's head. My 10-year-old daughter who dressed as Alice sewed her own White Rabbit, which she kept folded in her white apron. Her rabbit has a pocket watch, a red vest, and gear buttons for eyes. You can't see it in the picture, but Alice has an awesome bustle made out of faux leather and upholstery fabric from couch armrests we used to have. Around her waist corset she wears a chain with two "Drink Me" bottles attached, which were made of empty spice bottles decorated with gold-painted hot glue. One is filled with blue dish detergent, and the other with oil, vinegar and food coloring for and interesting look. The Queen of Hearts (me) wears a converted Snow White dress. I added a black corset and a red overskirt, hiked up with cords in the front to reveal the petticoat and yellow underskirt. My 14-year-old daughter had to help me with my hair, which managed to stay up using large velcro curlers and lots of hair pins. The King of Hearts wears pinstriped pants he made using masking tape and spray paint. I made his long coat by sewing two gray corduroy thrift store coats together and spray painting the whole thing. I added gears as buttons and faux fur trim.